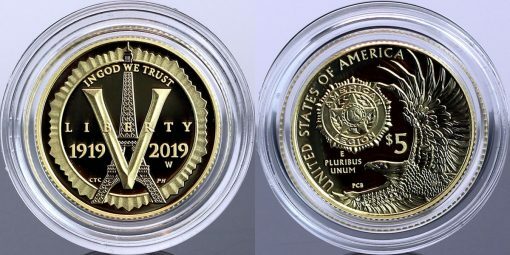 Released last Thursday at prices ranging from $25.95 to $418.75, the seven commemorative products realized first-day sales of 39,671 coins for $3,629,464.25. Orders through the weekend climbed by another 14,068 coins to a four-day total of 53,739 coins for $5,421,308.85. The new commemoratives were among the Mint’s best sellers. In its latest report, the U.S. Mint published sales data for 127 numismatic products. Thirty-five products outperformed their prior weekly gains against 38 previously. Not counting the new commemorative coins so as to compare apples to apples, 5 products increased by more than 1,000 units against 7 in the previous report. In addition, 13 products saw their sales reduced compared to 16 previously. The 5-ounce Apollo 11 coin saw the biggest loss, dropping 1,340 to 62,074. Below are tables showing the latest sales for U.S. Mint numismatic products. The sales period covers from March 11 to 17. Products with an asterisk (*) are no longer available or had no reported sales. So what is with the 5oz AG Apollo 11 puck? Numbers of sales keep trending downward for the past two weeks. Errors on this proof coin or is the collectability not as hoped for? I believe a lot of people who finally received their Back Order on the 5 OZ coins are returning them. I am keeping mine. Also looks like the American Legion 3-Coin Set is now on Back Order. The sales for the other American Legion coins is sad. Sales of the commems are down and makes you wonder if they will hit the target for the surcharge to be donated to the respective organizations? The fact the Mint is selling 1 oz of silver at almost $40 above spot makes them a poor value – if there is no additional collectible value then silver must his $54 an ounce just to recoup your cost not including shipping. If you really want one – just wait a year and buy it at below issue price. The Mint really needs to cut about $20 off the price of these coins otherwise the sales are going to keep trending downward. I HOPE this will be a turning point for the mint not to just crank out coins. We want coins that are 1)Beautiful and artistically well done. 2)NOT overpriced with an inflated surcharge. 3)Redundant…(Think clad proof set and silver proof set -the penny and nickel etc) or the limited edition silver sets with its duplicate quarters to the silver set) Each set should have its OWN space. 4)Realistic mintage limits and limited time availability. Get the fun back into it for coin collectors. Palladium dropped $46 per ounce today Friday, March 22 !! After going up so much most of last year & this year, I wonder if its upward movement can or will be sustained. It has been higher than gold for awhile now. Any thoughts on this situation since the Palladium American Eagle coin will be issued again later this year? Hello You are right Chuck. I took a survey about a month ago conducted by the mint. The last few questions on the survey were about the 2019 Palladium coin. The mint asked if I would buy the palladium coin with a price of $2300.00. I told them Noway .. that price is insane !! I invest in platinum each month that it is under $1,000 per ounce as I think it is vastly underpriced considering about 75% or more of all platinum comes from mines in Russia & South Africa. But, palladium IMHO is vastly overpriced as it was around $200 an oz. just a few years ago. Of course, I love & buy all versions of the Palladium American Eagle coin – such a beauty! Thanks for your comments. Happy collecting & investing all !